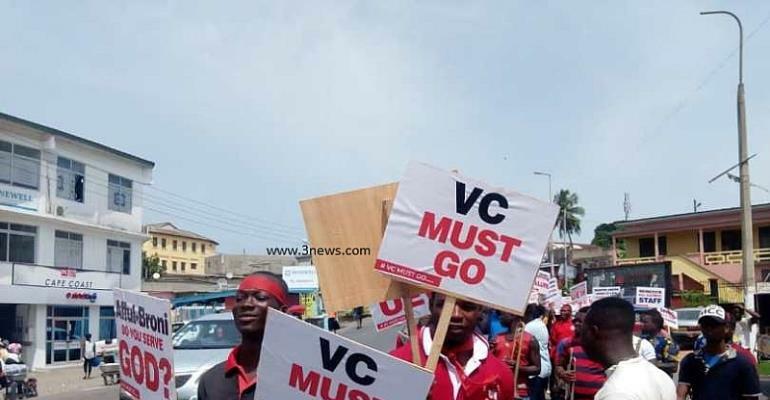 The Student Representative Council (SRC) of University of Education Winneba (UEW), has today dissociated itself from the demonstration that turned chaotic leading to the closure of the school a fortnight ago. In the past month, the student of the school demonstrated against the Vice Chancellor of the school, Prof. Dr. Afful Broni to force him to resign and reinstate some 23 senior lectures who he sacked. Their agitation, however, led to chaotic and violent picketing that left many properties in the school destroyed. Addressing a press conference on Thursday, 28th March 2019, SRC President of the UEW, Raymond Koffie revealed that the body prior to the demonstration never received any form of grievances from the section of student that engaged in the demonstration. Hence they disassociate and condemn the act completely. “The student representative council want to state emphatically that it did not initiate, take part or sponsor the lawlessness visited on our Winneba and Ejumako a section of students of this great University”. “This regrettable incidence, unfortunately, led to the indefinite closure of the Winneba and Ejumako campuses. The SRC as the official mouthpiece of the school wants to state for emphasis that it has not till now received any notification, submission or presentation of any grievance, either formally or informally from any of the aggrieved students”. “The council consequently disassociate itself completely from the process and subsequent destruction of private and public properties or facilities. We proceed to condemn in no uncertain times these acts or lawlessness and wanton destructions caused to lives and properties”, the SRC President said. The SRC go on to establish that even though the council appreciates that student at one point or the other may have grievances, the council is of the opinion that such grievances should, by all means, be expressed but in accordance with the laid down processes established for right thinking people to address their grievances and concerns. Raymond Koffie additionally stressed that the SRC is determined to pursue with passion and interest the welfare of students if the appropriate channels are used in making their demands known.